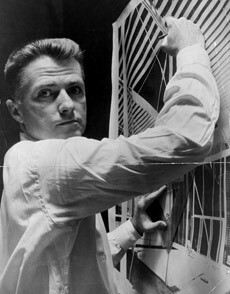 Paul Rudolph was born on October 23, 1918 in Elkton, Kentucky to Reverand Keener Rudolph and Eurye (nee Stone) Rudolph. 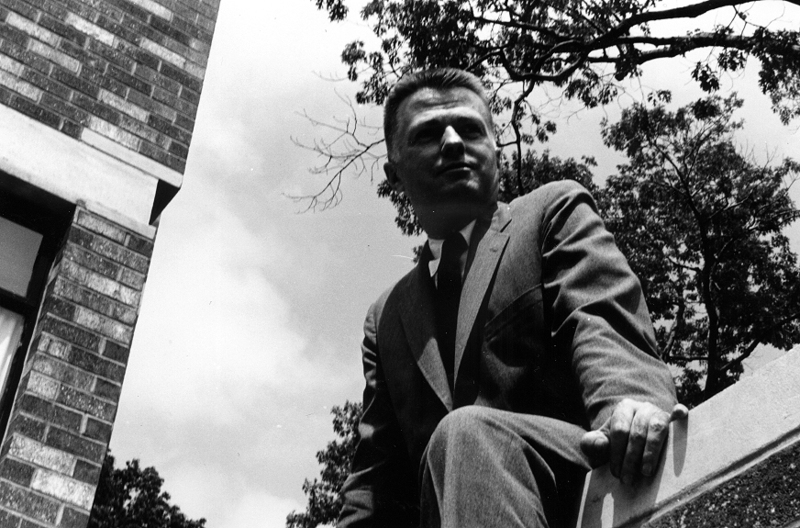 Paul Rudolph's childhood was spent traveling the country from parish to parish in a succession of different schools and rundown parsonages. As a result of his childhood, Rudolph resisted his parent's wish to become his father's successor. From 1935-1940, Rudolph studied architecture at the Alabama Polytechnic Institute (now Auburn University) where he received a Bachelor of Architecture degree. Rudolph entered the navy at the beginning of World War Two after his first semester at Harvard. He was stationed at the Brooklyn Naval Yard from 1942-1946 where he was put in charge of ship building. In 1940 at the age of 22, Rudolph went with his family to see the nearby Rosenbaum Residence - a Wright Usonian house - in Florence, Alabama. The emotional impact of the design left such an impression on Rudolph that he would recall the day until his death in 1997. He called the Rosenbaum living room "one of the most sublime spaces in American architecture." At a friend's suggestion, Rudolph moved to Sarasota, Florida in 1941 to work for Ralph Twitchell. He stayed for 6 months before leaving to study at the Harvard Graduate School of Design. In September of 1946 Rudolph went back to Harvard and received a Master of Architecture. He returned to work with Ralph Twitchell, who made him an associate in 1947. In 1948, Paul Rudolph received Harvard's Wheelwright Fellowship and traveled around Europe and England through mid-1949. The Healy Guest House, also known as the 'cocoon' house, employed a sprayed on roof technology that Rudolph discovered while in the navy. Rudolph was given the Award of Merit from the American Institute of Architects for Best House of the Year for his design of the Healy Guest House in 1949. In 1950, Rudolph became registered in Florida and began traveling between Florida and New York, where he lectured and taught at Yale, Harvard, Princeton, and other universities around the country. In March 1952, Rudolph left Twitchell's office to start his own firm. 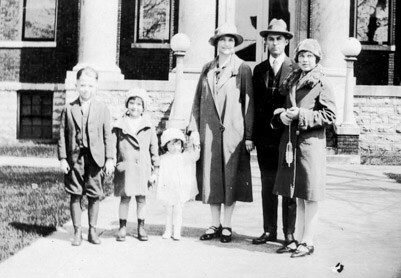 Rudolph continued to travel as a guest lecturer and critic as his practice grew in Florida. "The Good Design Exhibition" designed by Rudolph opened in January 1952 at the Museum of Modern Art in New York City, placing him among such distinguished designers as Charles and Ray Eames. In 1954 he was awarded the "Outstanding Young Architects Award" in an international competition in Sao Paulo, making him known as 'the most promising young architect' around the world thereafter. Also in 1954, Rudolph traveled to Jordan to begin work on a proposed U.S. Embassy, his first international project (and first public project outside of Florida) - which was to remain unbuilt. 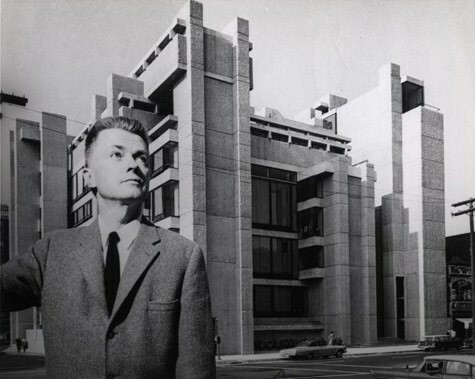 In the fall of 1957, Paul Rudolph was offered the Chairmanship of the School of Architecture at Yale University and opened another office in New Haven, Connecticut. Rudolph was appointed in February 1958. 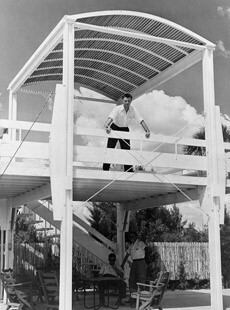 Rudolph continued to build projects in Sarasota, including the Deering Residence and the Milam Residence. He eventually closed the Florida office in April 1960. Rudolph's designs for his last projects in Florida are notable for their emphasis of mass and expression over the previous focus on light materials, modular bays and prefabricated components. The Milam residence was also the first project to incorporate air-conditioning, thus freeing Rudolph from design restrictions to mediate Florida's climate. 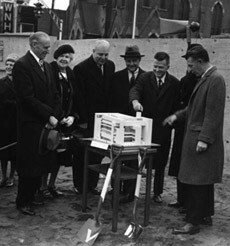 Shortly after assuming the Chairmanship at Yale, Rudolph was offered a number of construction projects on the campus. 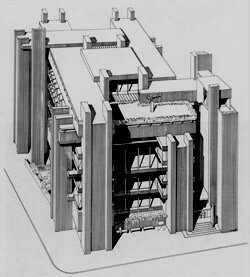 Greeley Memorial Laboratory and a housing complex for married students eventually led to the project that was to define - for good and for bad - Paul Rudolph's career. 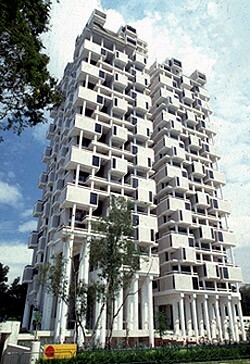 In 1958, Paul Rudolph was given a unique opportunity by Yale University President Whitney A. Griswold to design the building that he would occupy as Dean of the School of Architecture. 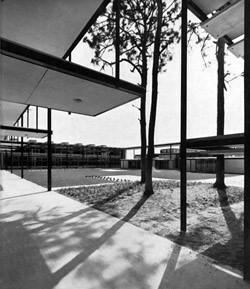 In effect, Rudolph became both the client and the architect for the project during its design from 1958 until its completion in 1964. Rudolph's design was radical considering Miesian glass boxes were the vernacular of the day. The building's vertical concrete exterior was designed as a foil to the horizontality of Kahn's Yale Art Gallery across the street. 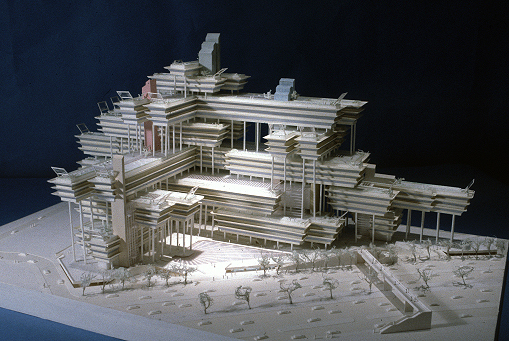 Located on a corner lot, Rudolph proposed a pin-wheel shaped plan consisting of 7 stories of studio levels which spiral around a central criticism and lecture area. The construction of the building was as innovative as the design itself. The building is almost entirely formed from concrete poured in place, with large steel-reinforced concrete beams spanning the open areas and vertical concrete piers used for mechanical services. Rudolph left the interior and exterior as exposed concrete, and developed a horizontal board and vertical ribbed finish in place of traditional surface treatments. After casting the wall, vertical wood forms were removed and the projections manually knocked off using hammers to reveal the stone aggregate cast into the concrete. The effect preserved the verticality of the design, and achieved the look of Rudolph's original renderings. From 1958-1965, as Rudolph's popularity reached new heights, he was offered larger projects and began to design buildings throughout the Northeast. Rudolph at the age of 44 in 1962 had established offices in Cambridge, New Haven and New York City. By this time he had already completed a diverse group of public projects - the Jewett Arts Center, Greeley Memorial Laboratory, an office building for Blue Cross/Blue Shield in Boston, and two schools in Florida. The range of influences in his work led the architectural press to question his direction in articles with titles like "Whither Paul Rudolph?" and "Rudolph at the Cross-roads". From 1960 onward, Rudolph began to clearly question the architectural theories he learned from Gropius during his time at Harvard. He concluded, "the end of architecture is to create space that is an appropriate psychological environment . . . One key to the problem is scale." The notion that scale is an often overlooked and misunderstood concept in architecture would be the focus of a dozen or so projects between 1958 and 1965. Scale at the human level, the building level and the city would dominate his work for the rest of his life. The Temple Street Garage in New Haven, Connecticut was designed by Rudolph to solve a growing urban problem - how to design a parking garage for 1,500 cars in a way that is both in scale with its environment and celebrates the automobile. Rudolph chose to double the supporting columns in a way to mediate the monumentality of the structure - a tool that would become a trademark. As Rudolph searched for an appropriate visual expression for his reexamination of what he considered lacking in modern architecture, he continued to use the same bush-hammered concrete finish he developed for Yale's Art & Architecture building. During this period Rudolph added the use of sculptured piers to his language of repetitious modular openings. Up until his time at Yale, Rudolph's work had been a progressive exploration of modularity and functionalism. The work produced while in New Haven began to focus more on expressive forms, the control of light and shadow, the play with scale and composition of different types of space. Rudolph began to see the need for space for the imagination as much for functional needs. Rudolph said, "many of our difficulties stem from the concept of functionalism as the only determinant of form. We cannot pretend to solve problems without precedent in form!" The most notable difference in his work during this period is Rudolph's focus on flowing, curving lines and sculptural masses. The articulation of the buildings during this time results from exagerations of the shapes of the functions within. As Rudolph moved away from functionalism and his buildings began to take on more sculptural qualities, he began to experiment with concrete block to achieve the look of his signature concrete finish without the cost. Rudolph developed a number of concrete block types - which were later to become ubiquitous - such as the fluted, ribbed and splitface block types. The culmination of this period was Rudolph's design for the Southeastern Massachusetts Technological Institute (now UMass Dartmouth). 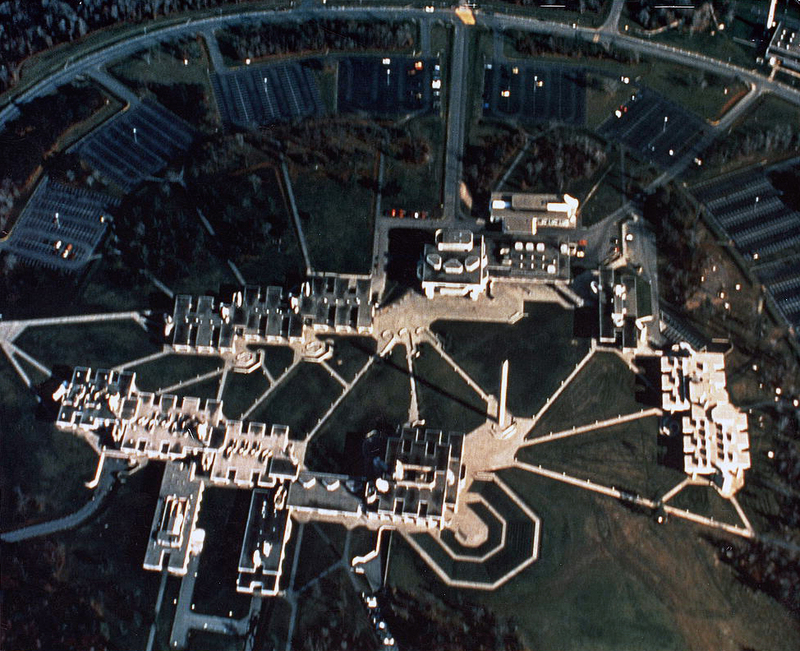 In this project Rudolph conceived the campus master plan as a spiraling internal mall, with classroom buildings facing each other from either side. Originally a commuter campus, Rudolph surrounded this composition with a ring of parking lots, allowing for a separation between the scale of the automobiles and the internal scale of the green space. After seven years of teaching at Yale, Rudolph left to practice architecture full time. In 1965, he moved his office to New York. On the night of June 14 1969, a fire broke out in the upper floors of the Art & Architecture building. A rumor spread that an unhappy student set the blaze as a critique of what was seen as an increasingly difficult building to work in. When the building was rennovated during the repairs, so much was altered that Rudolph said he didn't recognize it anymore. Rudolph would rarely speak about the building and not visit it again for almost 20 years. The rumors about the cause of the fire would forever damage Rudolph's reputation. At the end of the 1960s, Rudolph began to focus on the idea of creating complex compositions using simple modular elements. Influenced by Moshe Safdie's prefabricated housing at the Montreal World Fair in 1967, he designed the Graphic Arts Center in 1967. Rudolph predicted that mass-produced mobile homes, what he called the "Twentieth Century Brick", would become the basic building element in the future. At the same time Rudolph was commissioned by the Ford Foundation to study a large megastructure as part of the proposed Lower Manhattan Expressway in New York City. 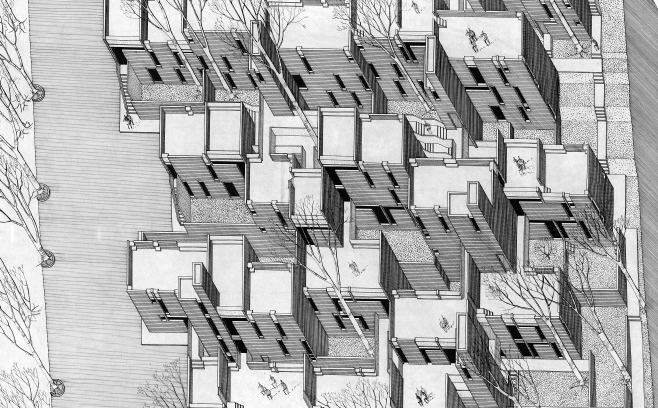 enrich the architectural possibilities of such unyielding problems as mass housing. they might be applied to the manufacture of multiple-room housing components. Although neither of these schemes was built, Rudolph continued to be fascinated with modular housing prototypes, using them in smaller projects such as Oriental Gardens in New Haven and the Green residence in Cherry Ridge, Pennsylvania. At the beginning of the 1970s, two important books were published about Rudolph's work: The Art & Architecture of Paul Rudolph by Sybil Moholy-Nagy in 1970 and an oversized book of his renderings in 1972. Despite the recognition his work was receiving, the amount of new commissions declined rapidly. In 1972, Robert Venturi and his wife Denise Scott Brown published Learning from Las Vegas in which they compared Rudolph's Crawford Manor with their Guild Hall in Pennsylvania. They argued that Rudolph's modernist building was too heroic and instead proposed the idea of a "decorated shed." 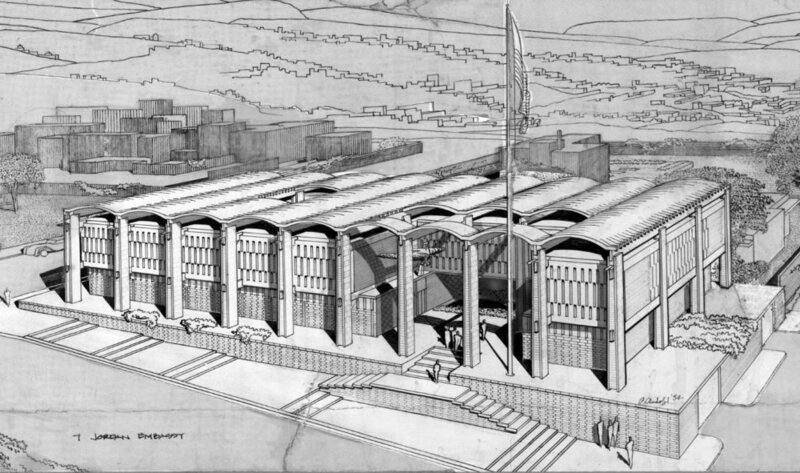 The argument was a sign of the changing currents in architecture away from Rudolph's monumental modernist works towards a new "post-modernism"
In spite of the severe blow to his reputation as a result of the renewed interest in historical styles by architects such as Charles Moore, Robert Stern and Michael Graves, Rudolph continued to receive commissions during the 1970's. At the end of the 1970's, Rudolph designed a pair of towers for the Bass Brothers in downtown Fort Worth, Texas. In the design, Rudolph argued that the scale of a high rise tower should be different between the base of the building, the middle of the tower and the top. The idea that a building's scale is read as base, shaft and capital is firmly routed in classical architecture. Rudolph's concern about the experience of scale with regard to highrise buildings would be the subject of exploration for the remainder of his career, especially as he began to design projects overseas. In 1981, Rudolph began work on the Concourse, a five acre site in Singapore. The complex was composed of three parts: offices in a tall tower, with apartments hovering above a shopping mall podium. 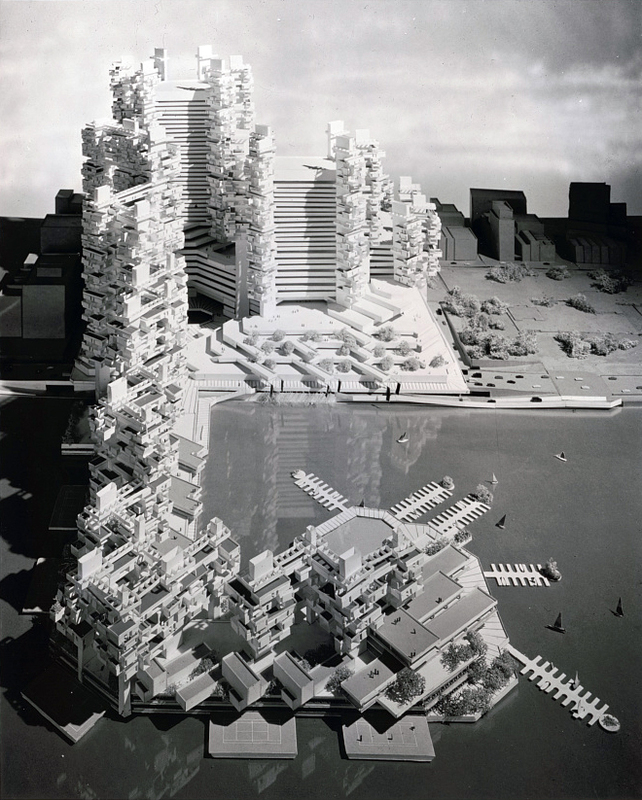 Rudolph created a different architectural expression for each part of the project, keeping with his belief that variety is an important part of urbanism. Rudolph continued to explore scale in his design for the Dharmala Sakti headquarters in 1982. Located in Jakarta, Indonesia the building's design reflects Rudolph's concern for regionalism by taking cues from the deep roof overhang of traditional Indonesian architecture resulting in a striking angular building façade. To vary the scale of the building, Rudolph rotated the square floor plan in and out of the paired structural columns, so that the body of the tower is composed of 6 sets of repeating floor plate configurations. 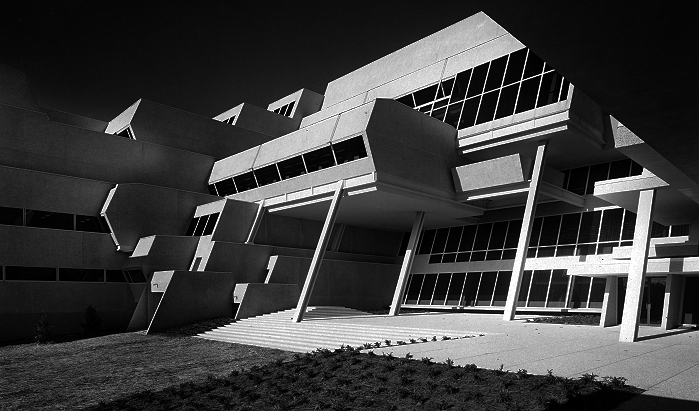 Like he began to do in the design for the Bass Towers in Fort Worth, Rudolph created a heavily articulated podium with paired exposed structural columns. Above the base with its varied programmatic elements the tower is segmented into repeating clusters of facades, thereby creating multiple scales in the single building. Paul Rudolph designed the Bond Centre - now the Lippo Centre - as a pair of twin towers on Hong Kong island on the edge of the harbor in 1984. As Rudolph disliked symmetry, the towers are not exactly the same - one is 36 stories tall and the other is 40. The base of the building, as with his previous designs, is a complicated series of bridges and mezzanines and tie the building into the city's elevated walkways. At the base Rudolph exposes the building's columns, that rise up at different heights which Rudolph likened to hydraulic pumps pushing the building into the sky. The towers are both octagonal in plan, with four long and four short sides. In order to add scale to the glass curtainwall shaft of the towers, Rudolph created alternating projected floors, giving the building the appearance of hands grabbing each tower. This element created better views for corner offices and resulted in the building being known locally as the "koala building." 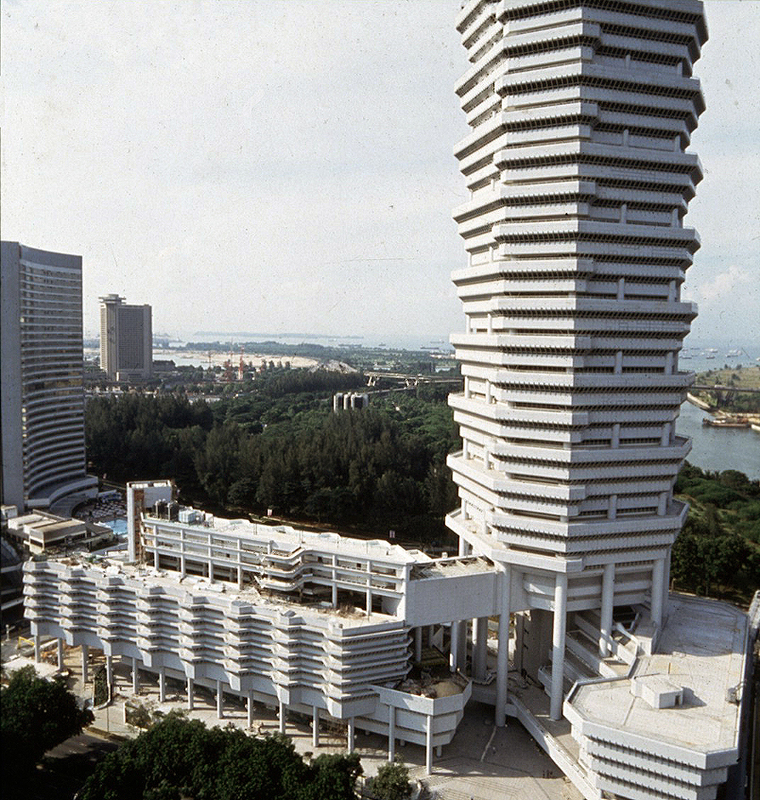 For the design of the Colonnade Condominium project in Singapore, Rudolph returned to the "Twentieth Century Brick" concept that he had developed as part of the Graphic Arts Center in the late 1960s. Rudolph originally proposed the building be composed of factory-built units that were assembled on site. The cost proved to be too much, so the building was built out of poured concrete and infill panels, with the modular appearance maintained. Rudolph again varies the scale of the tower by raising it on a series of round columns exposed at the building's base, giving the building its name. The shaft of the tower consists of a series of repeating solids and voids providing each unit with a double height living room and private terrace. To further add scale to the buildings mass, the stair shafts and elevator core are recessed, dividing the plan into quadrants. In 1989 the Sino land company held a competition to design the tallest building in Asia, to be located in Hong and known as the Sino Tower. For his proposal, Rudolph designed a structure similar to the Eiffel Tower. The legs of the building, eight twin sets of splayed columns rose 150 feet into the air to hold the hotel above. 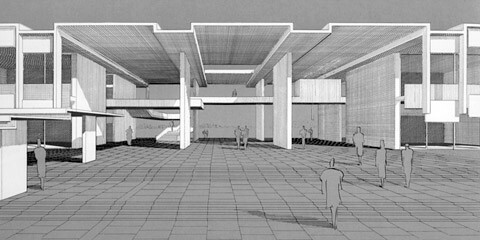 The base of the building included the entrance, exhibition and retail areas. Above the hotel, Rudolph positioned 6 blocks of offices with overhanging corners like those used in the Dharmala Sakti building. The scale of the tower itself was divided into units of 10 floors each, with a vertical separation for mechanical services. Although none of the proposed schemes was ever built, Rudolph's design reflects his life-long pursuit of scale in highrise buildings. Rudolph continued into the 1990's to design large housing and office developments in Asia, most of which were never built. Institution Hill Condominiums in Singapore was proposed to be a series of interconnected towers of different heights to appear to grow out of the site. His design for Gatot Subroto in Indonesia was also never built and consisted of multiple segments to break down the scale of the large office and condominium complex. On August 8, 1997 Paul Rudolph passed away in New York City from mesothelioma, a cancer that usually results from exposure to asbestos - probably during his years at the Brooklyn Navy Shipyard. At the time of his death he was working on plans for a new town of 250,000 people in Indonesia, and a private residence, chapel and office complex in Singapore.